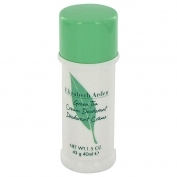 Green Tea by Elizabeth Arden is a Citrus Aromatic fragrance for women. Green Tea was launched in 1999. The nose behind this fragrance is Francis Kurkdjian. Top notes are rhubarb, mint, orange peel, bergamot and lemon; middle notes are carnation, musk, jasmine, oakmoss, white amber and fennel; base notes are caraway, amber, musk, green tea, jasmine, cloves, oakmoss and celery seeds.